The Coastal Redwoods are the world's tallest trees, and a walk through a redwood forest is awe-inspiring. They are appropriate for use in the landscape, and will thrive with lawn watering. Even in cultivation it is a large tree, but can be judiciously pruned or limbed up without destroying its beauty. Redwoods can even be planted three to four feet apart and pruned to make a hedge. 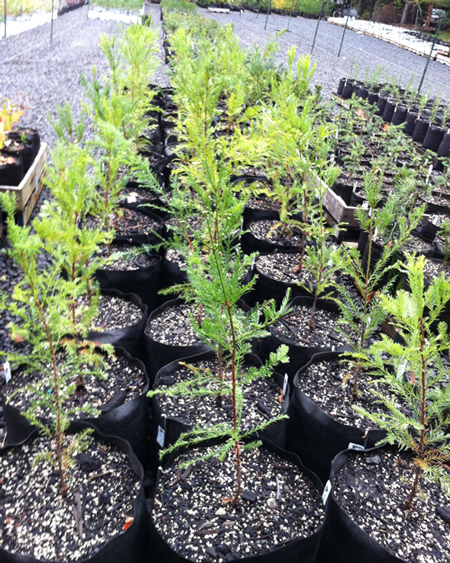 You can create your own grove (then plant it with the related species, ferns, huckleberry, etc. ), by putting young redwoods fifteen or twenty feet apart, in a cluster or circle. The trees grow quickly when young. Winters of extreme cold may cause the needles to brown, even defoliate. We've had winters as cold as twelve below zero, and our redwoods came back fine. Wildlife use these trees for shelter; the wide-spreading branches provide good winter protection. Fibrous bark is shredded for nest building by squirrels, and I've seen songbirds carrying wisps of it to their nests, too. These magnificent, massive trees of our Southern Oregon, Northern California coastal region, are loved for their great height, 365ft in the wild, 60-80ft in cultivation. The graceful, almost delicate foliage is much admired. Bark is thick, soft, red-brown, a natural protection from fire. Feathery branches hold 2-ranked, deep green needles. Cones seem tiny for such a large and impressive tree, only ½-1 3/8inch long are reddish-brown. Give this tree room to spread and deep, fertile soil. It requires regular moisture, tolerates lawn watering. 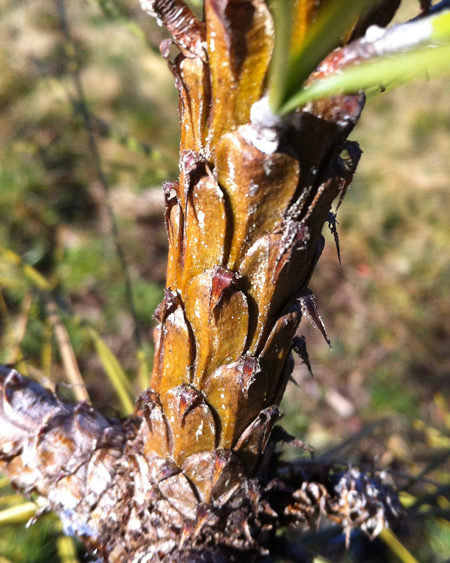 Close-up of the bark on spring's new growth. 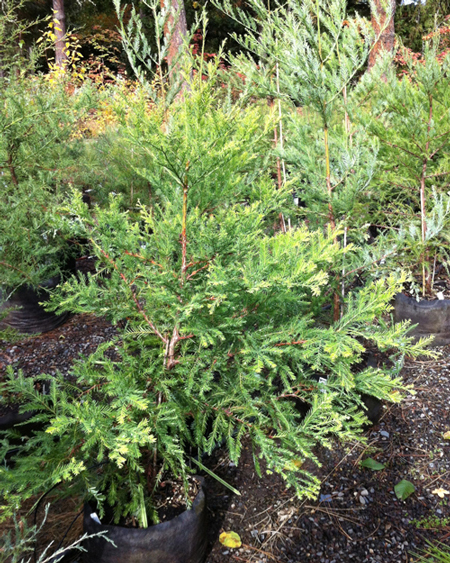 Conifer Size 1 gallon2 gallon10 ft.15 ft.